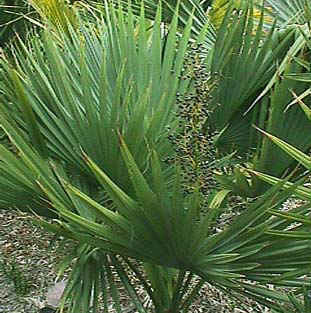 Saw palmetto is a low, shrubby plant grows to 6 feet; the trunk or rootstock remains below the ground, producing palmate, green to white-coated leaves on saw-toothed petioles. Has horizontal creeping stems above ground. Leaves fanlike, with sword-shaped leaf blades radiating from a central point. Flowers are whitish green, with 3-5 petals; May to July. The olive-like, dark-purple to black fleshy berries, 1 inch long, surrounding one large seed, grow in bunches or clusters, ripening from October to December. Found growing in dense stands along the Atlantic coast in Georgia and Florida. Low pine woods, savannas, thickets. South Carolina, Georgia, Florida to Alabama, Mississippi. Essential oil, fatty oil, with capric, caprylic and lauric acids, fatty acids, carotene, tannin, sitosterol invert sugar, estrogenic substance. The berries are particularly useful for conditions associated with colds, hayfever, asthma, and bronchitis. Catarrhal problems and mucous congestion respond to a tea made from the dried berries. The tea has also been recommended as a general tonic to build strength during convalescence from illness. Used for colds, coughs, inflammations, coughs, irritated mucous membranes, tickling feeling in the throat, migraine. A suppository of the powdered fruits in cocoa butter was used as a uterine and vaginal tonic. Saw palmetto is considered by some to have aphrodisiac powers. Said to improve prostate health (combined with echinacea). Used to treat “honeymoon cystitis” in females. Although the FDA does not recognize this herb as an effective drug, in Germany it is sold over-the-counter as a treatment for benign prostate problems. Benign prostate enlargement can cause excessive urination in men, especially annoying at night. Infusion: steep 1 tsp. dried berries in 1 cup water. Take 1-2 cups a day. Extract: mix 30 to 60 drops in liquid per day. Fruit extracts, capsules, tablets, tincture. Any man experiencing pain or swelling of the prostate, or has difficulty urinating, or passes any blood in the urine, should be examined by a medical physician ASAP.